6 Series Portable Borehole Loggers - Delta Epsilon Instruments Inc. The 6 Series logging systems are our highest performance portable loggers with maximum depth capability and a number of significant operational features. Available configurations include the 600 DL as a six hundred meter single conductor system, 6B-1K as a one thousand meter system or GVX4 as a five hundred meter four conductor system capable of running borehole video as well as geophysical logs. The 6 Series are self contained and an integrated design comprised of the winch assembly, winch motor controller, backlit digital depth and speed indicators, uphole power supply and USB compatible PC interface. 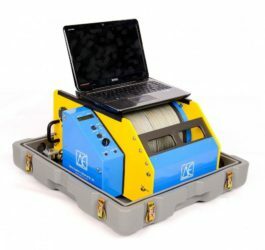 This minimizes connecting cables and results in a more compact, cost effective borehole logger. The 6 Series logging systems run under the supplied DELogger software and logging data output is stored in the LAS format. All systems are a compact integrated design, operate directly from a 12 Vdc. source and do not require a generator or inverter. All systems are driven by a powerful 12Volt motor and efficient planetary transmission. All systems feature an automatic cable level wind that typically spools the entire length of cable without requiring adjustments or other corrections. An intuitive level wind clutch and manual adjustment feature is incorporated for spooling corrections should they be required. Unlike competing systems, all critical mechanical elements are covered and protected from moisture, abrasive dirt and mud. Mechanical Disc Brake and One Way Clutch. Common to all Delta Epsilon loggers but not found on competing systems, this unique feature ensures that the winch cannot creep backwards or inadvertently reverse direction. This arrangement also ensures that probe descent is always controlled, and that the winch drum is secured and cannot rotate during transport. All 6 Series logging systems are shock mounted in a compact, rugged MIL spec. case for transport and storage. All components are constructed entirely from aluminum, stainless steel and corrosion resistant materials. All appropriate surfaces are powdercoated or anodized. 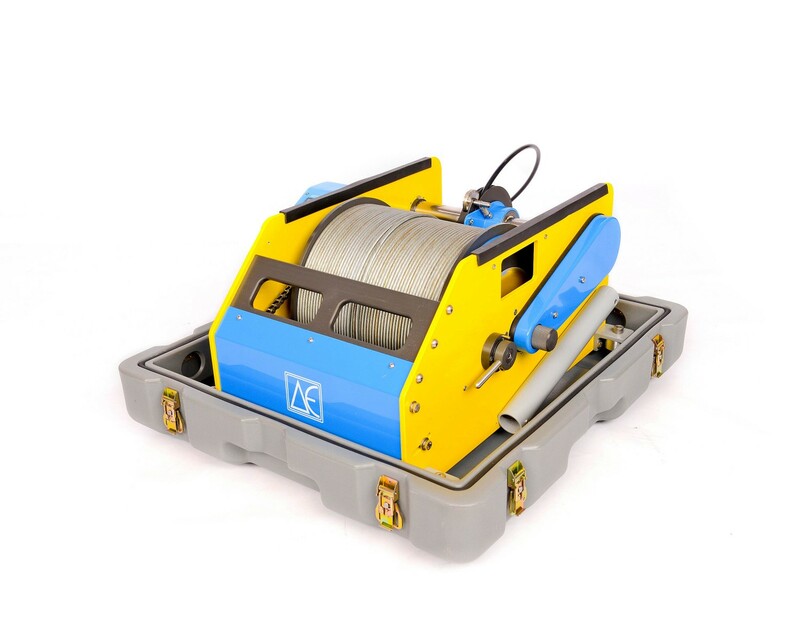 The 6 Series GVX4 configuration may be fitted with up to 500 meters of 3/16” four conductor steel armored logging cable. 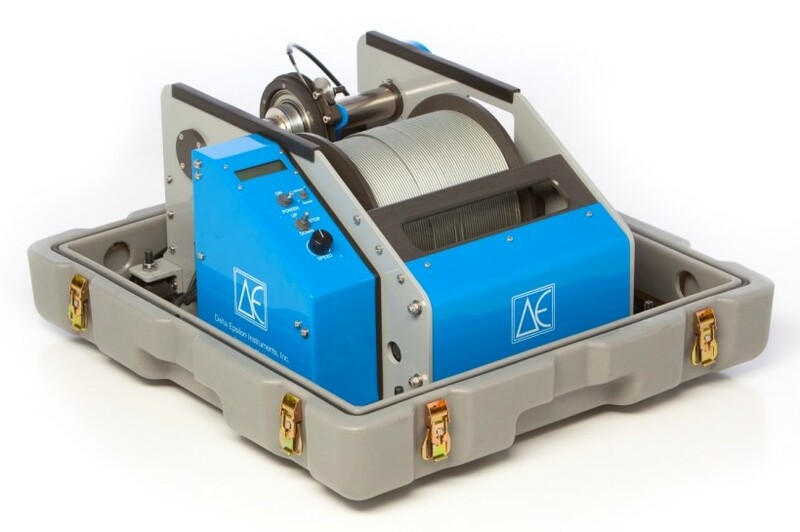 The advantages of this configuration are twofold: (A) the GVX 4 serves as a platform to perform comprehensive borehole geophysical logging surveys, and (B) to perform high resolution borehole video surveys utilizing a DE/BCM01 Borehole Camera. 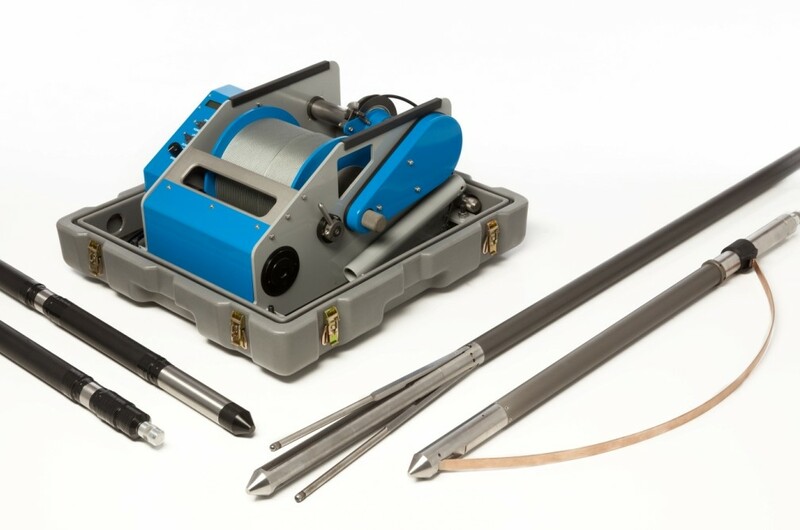 Of necessity borehole video surveys typically are performed utilizing fragile coaxial cable that also has intrinsic limitations for geophysical logging. This commonly necessitates the purchase or use of both a dedicated video survey system as well as a geophysical logging system. 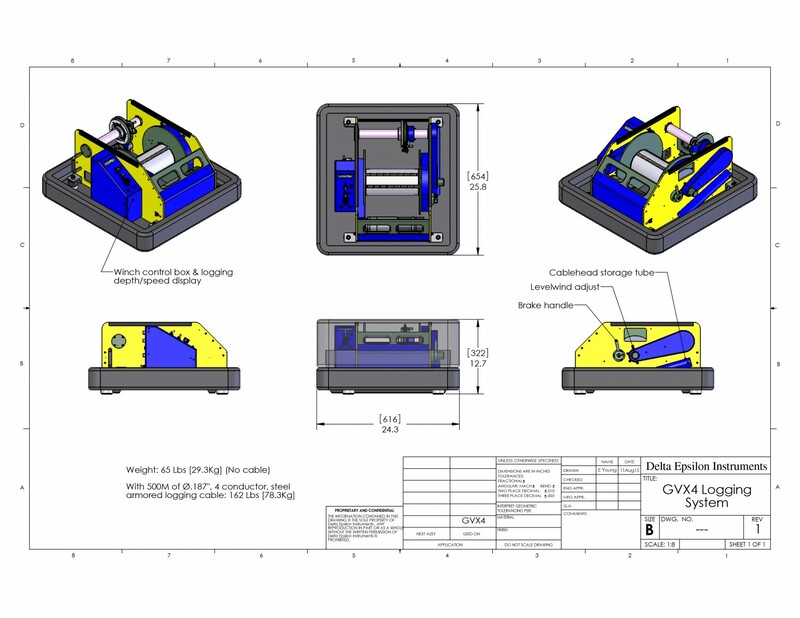 The GVX4 overcomes these limitations and offers both a comprehensive geophysical logging capability and high resolution borehole video capability all on the same platform utilizing robust and dependable steel armored logging cable. Delta Epsilon portable loggers are available in three basic configurations. 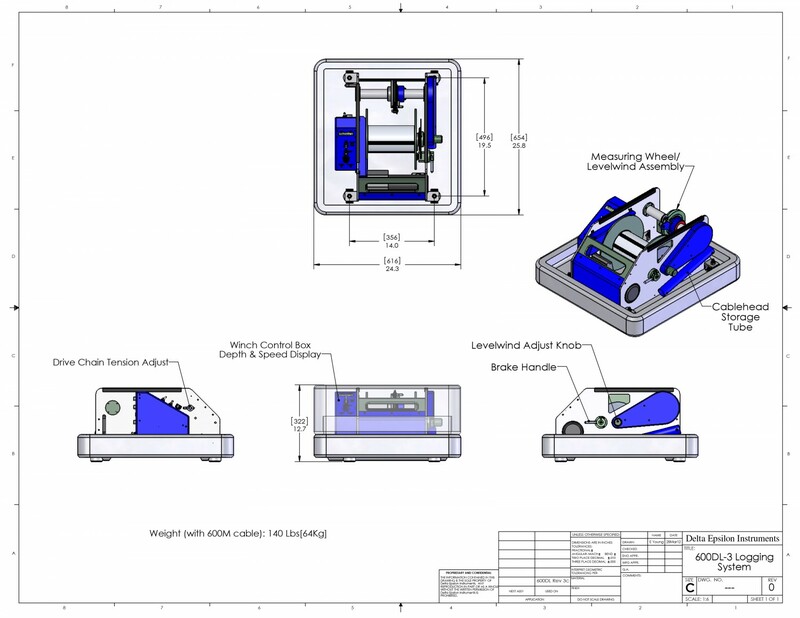 Each configuration is a unique, versatile platform optimized for its intended purpose.